Uranium (chemical symbol U, atomic number 92) is a silvery metallic chemical element in the actinide series of the periodic table. The heaviest naturally occurring element, uranium is nearly twice as dense as lead and weakly radioactive. It occurs naturally in low concentrations (a few parts per million) in soil, rock and water, and is commercially extracted from uranium-bearing minerals such as uraninite (see uranium mining). In nature, uranium atoms exist as uranium-238 (99.275 percent), uranium-235 (0.72 percent), and a very small amount of uranium-234 (0.0058 percent). Uranium decays slowly by emitting an alpha particle. The half-life of uranium-238 is about 4.5 billion years and that of uranium-235 is 700 million years, making them useful in dating the age of the Earth. Along with thorium and plutonium, it is one of the three fissile elements, meaning it can easily break apart to become lighter elements. This property of uranium-235 and to a lesser degree uranium-233 generates the heat needed to run nuclear reactors and provides the explosive material for nuclear weapons. Both uses rely on the ability of uranium to produce a sustained nuclear chain reaction. Depleted uranium (uranium-238) is used in kinetic energy penetrators and armor plating. In addition to its uses in nuclear technology, uranium has been used as a colorant in uranium glass, producing orange-red through lemon yellow hues. It was also used for tinting in early photography. 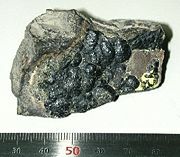 Uraninite, also known as Pichblende, is the most common ore mined to extract uranium. Uranium is a naturally occurring element that can be found in low levels within all rock, soil, and water. Uranium is also the highest-numbered element to be found naturally in significant quantities on earth and is always found combined with other elements. It, along with all elements with atomic weights higher than iron, are only naturally formed in supernova explosions. The decay of uranium, thorium and potassium-40 in the Earth's mantle is thought to be the main source of heat that keeps the outer core liquid and drives mantle convection, which in turn drives plate tectonics. Its average concentration in the Earth's crust is (depending on the reference) 2 to 4 parts per million, or about 40 times as abundant as silver. The Earth's crust from the surface to 25 km (15 miles) down is calculated to contain 1017 kg (2 x 1017 lb) of uranium while the oceans may contain 1013 kg (2 x 1013 lb). The concentration of uranium in soil ranges from 0.7 to 11 parts per million (up to 15 parts per million in farmland soil due to use of phosphate fertilizers) and 3 parts per billion of sea water is composed of the element. It is more plentiful than antimony, tin, cadmium, mercury, or silver and is about as abundant as arsenic or molybdenum. It is found in hundreds of minerals including uraninite (the most common uranium ore), autunite, uranophane, torbernite, and coffinite. Significant concentrations of uranium occur in some substances such as phosphate rock deposits, and minerals such as lignite, and monazite sands in uranium-rich ores (it is recovered commercially from these sources with as little as 0.1 percent uranium). It has been shown in some recent work at Manchester that bacteria can reduce and fix uranium in soils. This research is continuing at the university of Plymouth by Dr Keith Roach and S Handley. Some micro-organisms, such as the lichen Trapelia involuta or the bacterium Citrobacter, can absorb concentrations of uranium that are up to 300 times higher than their environment. Citrobactor species absorb uranyl ions when given glycerol phosphate (or other similar organic phosphates). After one day, one gram of bacteria will encrust themselves with nine grams of uranyl phosphate crystals; creating the possibility that these organisms could be used to decontaminate uranium-polluted water. Plants absorb some uranium from the soil they are rooted in. Dry weight concentrations of uranium in plants range from 5 to 60 parts per billion and ash from burnt wood can have concentrations up to 4 parts per million. Dry weight concentrations of uranium in food plants are typically lower with one to two micrograms per day ingested through the food people eat. Uranium ore is mined in several ways: by open pit, underground or by leaching uranium from low-grade ores (see uranium mining). Uranium ore typically contains 0.1 to 0.25 percent of actual uranium oxides so extensive measures must be employed to extract the metal from its ore. Uranium ore is crushed and rendered into a fine powder and then leached with either an acid or alkali. The leachate is then subjected to one of several sequences of precipitation, solvent extraction, and ion exchange. The resulting mixture, called yellowcake, contains at least 75 percent uranium oxides. Yellowcake is then generally further refined using nitric acid to create a solution of uranyl nitrate. Additional solvent extraction procedures finish the process. Commercial-grade uranium can be produced through the reduction of uranium halides with alkali or alkaline earth metals. Uranium metal can also be made through electrolysis of KUF5 or UF4, dissolved in a molten calcium chloride (CaCl2) and sodium chloride (NaCl). Very pure uranium can be produced through the thermal decomposition of uranium halides on a hot filament. 10 countries are responsible for over 95 percent of the global production of concentrated uranium oxides. In 2005 seventeen countries produced concentrated uranium oxides; with Canada (27.9 percent) and Australia (22.8 percent) being the largest producers and Kazakhstan (10.5 percent), Russia (8.0 percent), Namibia (7.5 percent), Niger (7.4 percent), Uzbekistan (5.5 percent), the United States (2.5 percent), the Ukraine (1.9 percent), and China (1.7 percent) also producing significant amounts. Three million metric ton of uranium ore reserves are known to exist and an additional five billion metric ton of uranium are estimated to be in sea water (Japanese scientists in the 1980s proved that extraction of uranium from sea water using ion exchangeers was feasible). Australia has the world's largest uranium ore reserves—40 percent of the planet's known supply. In fact, the world's largest single uranium deposit is located at the Olympic Dam Mine in South Australia. Almost all the uranium is exported, but under strict International Atomic Energy Agency safeguards to satisfy the Australian people and government that none of the uranium is used in nuclear weapons. As of 2006, the Australian government was advocating an expansion of uranium mining, although issues with state governments and indigenous interests complicate the issue. The largest single domestic source of uranium in the United states was the Colorado Plateau located in Colorado, Utah, New Mexico, and Arizona. United States Federal government paid discovery bonuses and guaranteed purchase prices to anyone who found and delivered Uranium ore. The United States Government was the sole legal purchaser of the uranium. The economic incentives resulted in a frenzy of exploration and mining activity throughout the Colorado plateau from 1947 through 1959 that left thousands of miles of crudely graded roads spiderwebbing the remote deserts of the Colorado Plateau, and thousands of abandoned uranium mines, exploratory shafts, and tailings piles. The frenzy ended as suddenly as it had begun, when the U.S. governments stopped purchasing the uranium. The use of uranium, in its natural oxide form, dates back to at least 79 C.E., when it was used to add a yellow color to ceramic glazes. Yellow glass with 1 percent uranium oxide was found in a Roman villa on Cape Posilipo in the Bay of Naples, Italy by R. T. Gunther of the University of Oxford in 1912. Starting in the late Middle Ages, pitchblende was extracted from the Habsburg silver mines in Joachimsthal, Bohemia (now in the Czech Republic) and was used as a coloring agent in the local glassmaking industry. In the early nineteenth century, the world's only known source of uranium ores were these old mines. Antoine Becquerel discovered the phenomenon of radioactivity by exposing a photographic plate to uranium (1896). The discovery of the element is credited to the German pharmacist Martin Heinrich Klaproth, who named the new element after the planet Uranus. While working in his experimental laboratory in Berlin in 1789, Klaproth was able to precipitate a yellow compound (likely sodium diuranate) by dissolving pitchblende in nitric acid and neutralizing the solution with sodium hydroxide. Klaproth mistakenly assumed the yellow substance was the oxide of a yet-undiscovered element and heated it with charcoal to obtain a black powder, which he thought was the newly discovered metal itself (in fact, that powder was an oxide of uranium). He named the newly discovered element after the planet Uranus, which had been discovered eight years earlier by William Herschel. In 1841, Eugene-Melchior Peligot, who was Professor of Analytical Chemistry at the Central School of Arts and Manufactures in Paris, isolated the first sample of uranium metal by heating uranium tetrachloride with potassium. Uranium was not seen as being particularly dangerous during much of the nineteenth century, leading to the development of various uses for the element. One such use for the oxide was the coloring of pottery and glass. Antoine Becquerel discovered radioactivity by using uranium in 1896. Becquerel made the discovery in Paris by leaving a sample of uranium on top of an unexposed photographic plate in a drawer and noting that the plate had become 'fogged'. He determined that a form of invisible light or rays emitted by uranium had exposed the plate. Enrico Fermi (bottom left) and the rest of the team that initiated the first artificial nuclear chain reaction (1942). A team led by Enrico Fermi in 1934 observed that bombarding uranium with neutrons produces the emission of beta rays (electrons or positrons; see beta particle). The experiments leading to the discovery of uranium's ability to fission (break apart) into lighter elements and release binding energy were conducted by Otto Hahn and Fritz Strassmann in Hahn's laboratory in Berlin. Lise Meitner and her nephew, physicist Otto Robert Frisch, published the physical explanation in February 1939 and named the process 'nuclear fission'. Soon after, Fermi hypothesized that the fission of uranium might release enough neutrons to sustain a fission reaction. Confirmation of this hypothesis came in 1939 and later work found that 2 1/2 neutrons are released by each fission of the rare uranium isotope uranium-235. Further work found that the far more common uranium-238 isotope can be transmuted into plutonium, which, like uranium-235, is also fissionable by thermal neutrons. On December 2, 1942, another team led by Enrico Fermi was able to initiate the first artificial nuclear chain reaction. Working in a lab below the stands of Stagg Field at the University of Chicago, the team created the conditions needed for such a reaction by piling together 400 tons (360 metric tons) of graphite, 58 tons (53 metric tons) of uranium oxide, and six tons (five and a half metric tons) of uranium metal. Later researchers found that such a chain reaction could either be controlled to produce usable energy or could be allowed to go out of control to produce an explosion more violent than anything possible using chemical explosives. The mushroom cloud over Hiroshima after the dropping of the uranium-based atomic bomb nicknamed 'Little Boy' (1945). Two major types of atomic bomb were developed in the Manhattan Project during World War II: a plutonium-based device (see Trinity test and 'Fat Man') whose plutonium was derived from uranium-238, and a uranium-based device (nicknamed 'Little Boy') whose fissile material was highly enriched uranium. The uranium-based Little Boy device became the first nuclear weapon used in war when it was detonated over the Japanese city of Hiroshima on August 6, 1945. Exploding with a yield equivalent to 12,500 metric tons of TNT, the blast and thermal wave of the bomb destroyed nearly 50,000 buildings and killed approximately 75,000 people (see Atomic bombings of Hiroshima and Nagasaki). Initially it was believed that uranium was relatively rare, and that nuclear proliferation could be avoided by simply buying up all known uranium stocks, but within a decade large deposits of it were discovered in many places around the world. Four light bulbs lit with electricity generated from the first artificial nuclear reactor, EBR-I (1951). Experimental Breeder Reactor I at the Idaho National Engineering and Environmental Laboratory near Arco, Idaho became the first functioning artificial nuclear reactor on December 20 1951. Initially, only four 150-watt light bulbs were lit by the reactor but improvements eventually enabled it to power the whole facility (later, the whole town of Arco became the first in the world to have all its electricity come from nuclear power). The world's first commercial scale nuclear power station, Calder Hall, in England, began generation on October 17 1956. Another early power reactor was the Shippingport Reactor in Pennsylvania, which began electricity production in 1957. Nuclear power was used for the first time for propulsion by a submarine, the USS Nautilus, in 1954. Fifteen ancient and no longer active natural fission reactors were found in three separate ore deposits at the Oklo mine in Gabon, West Africa in 1972. Discovered by French physicist Francis Perrin, they are collectively known as the Oklo Fossil Reactors. The ore they exist in is 1.7 billion years old; at that time, uranium-235 comprised about three percent of the total uranium on Earth. This is high enough to permit nuclear fission to occur, providing other conditions are right. The ability of the surrounding sediment to contain the nuclear waste products in less than ideal conditions has been cited by the U.S. federal government as evidence of their claim that the Yucca Mountain facility could safely be a repository of waste for the nuclear power industry. U.S. and USSR/Russian nuclear weapons stockpiles, 1945-2006. During the Cold War between the Soviet Union and the United States, huge stockpiles of uranium were amassed and tens of thousands of nuclear weapons were created, using enriched uranium and plutonium made from uranium. Since the break-up of the Soviet Union in 1991, an estimated 600 tons (540 metric tons) of highly-enriched weapons grade uranium (enough to make 40,000 nuclear warheads) have been stored in often inadequately guarded facilities in the Russian Federation and several other former Soviet states. 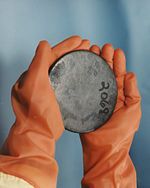 Police in Asia, Europe, and South America on at least 16 occasions from 1993 to 2005 have intercepted shipments of smuggled bomb-grade uranium or plutonium, most of which was from ex-Soviet sources. From 1993 to 2005 the Material Protection, Control, and Accounting Program, operated by the federal government of the United States, spent approximately US$550 million to help safeguard uranium and plutonium stockpiles in Russia. Nuclear fallout and pollution have occurred from above-ground nuclear tests and several nuclear accidents: the Windscale fire at the Sellafield nuclear plant in 1957 spread iodine-131 over much of Northern England, the Three Mile Island accident in 1979 released radon gas and some iodine-131, the Chernobyl disaster in 1986 released radon, iodine-131 and strontium-90 that spread over much of Europe. An induced nuclear fission event involving uranium-235. Uranium is an inner transition metal of the actinide series, situated in period 7 of the periodic table, between protactinium and neptunium. When refined, it is a silvery white, weakly radioactive metal, which is slightly softer than steel, strongly electropositive and a poor electrical conductor. It is malleable, ductile, and slightly paramagnetic. Uranium metal has very high density, 65 percent more dense than lead, but slightly less dense than gold. Uranium metal reacts with nearly all nonmetallic elements and their compounds with reactivity increasing with temperature. Hydrochloric and nitric acids dissolve uranium but nonoxidizing acids attack the element very slowly. When finely divided, it can react with cold water; in air, uranium metal becomes coated with a dark layer of uranium oxide. Uranium in ores is extracted chemically and converted into uranium dioxide or other chemical forms usable in industry. Uranium was the first element that was found to be fissile. 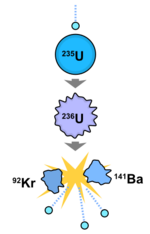 Upon bombardment with slow neutrons, its uranium-235 isotope becomes a very short lived uranium-236 isomer which immediately divides into two smaller nuclei, releasing nuclear binding energy and more neutrons. If these neutrons are absorbed by other uranium-235 nuclei, a nuclear chain reaction occurs and, if there is nothing to absorb some neutrons and slow the reaction, the reaction is explosive. As little as 15 lb (7 kg) of uranium-235 can be used to make an atomic bomb. The first atomic bomb worked by this principle (nuclear fission). Pie-graphs showing the relative proportions of uranium-238 (blue) and uranium-235 (red) at different levels of enrichment. Naturally occurring uranium is composed of three major isotopes, uranium-238 (99.28 percent natural abundance), uranium-235 (0.71 percent), and uranium-234 (0.0054 percent). All three isotopes are radioactive, creating radioisotopes, with the most abundant and stable being uranium-238 with a half-life of 4.51 × 109 years (close to the age of the Earth), uranium-235 with a half-life of 7.13 × 108 years, and uranium-234 with a half-life of 2.48 × 105 years. Uranium-238 is an α emitter, decaying through the 18-member uranium natural decay series into lead-206. The decay series of uranium-235 (also called actinouranium) has 15 members that ends in lead-207, protactinium-231 and actinium-227. The constant rates of decay in these series makes comparison of the ratios of parent to daughter elements useful in radiometric dating. Uranium-233 is made from thorium-232 by neutron bombardment. The isotope uranium-235 or enriched uranium is important for both nuclear reactors and nuclear weapons because it is the only isotope existing in nature to any appreciable extent that is fissile, that is, can be broken apart by thermal neutrons. The isotope uranium-238 is also important because it absorbs neutrons to produce a radioactive isotope that subsequently decays to the isotope plutonium-239, which also is fissile. To be considered 'enriched' the uranium-235 fraction has to be increased to significantly greater than its concentration in naturally-occurring uranium. Enriched uranium typically has a uranium-235 concentration of between 3 and 5 percent. The process produces huge quantities of uranium that is depleted of uranium-235 and with a correspondingly increased fraction of uranium-238, called depleted uranium or 'DU'. To be considered 'depleted', the uranium-235 isotope concentration has to have been decreased to significantly less than its natural concentration. The gas centrifuge process, where gaseous uranium hexafluoride (UF6) is separated by weight using high-speed centrifuges, has become the cheapest and leading enrichment process (lighter UF6 concentrates in the center of the centrifuge). 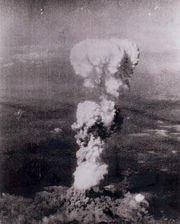 The gaseous diffusion process was the previous leading method for enrichment and the one used in the Manhattan Project. In this process, uranium hexafluoride is repeatedly diffused through a silver-zinc membrane and the different isotopes of uranium are separated by diffusion rate (uranium 238 is heavier and thus diffuses slightly slower than uranium-235). The laser excitation method employs a laser beam of precise energy to sever the bond between uranium-235 and fluorine. This leaves uranium-238 bonded to fluorine and allows uranium-235 metal to precipitate from the solution. Another method is called liquid thermal diffusion. Ions that represent the four different oxidation states of uranium are soluble and therefore can be studied in aqueous solutions. They are: U3+ (red), U4+ (green), UO2+ (unstable), and UO2+ (yellow). A few solid and semi-metallic compounds such as UO and US exist for the formal oxidation state uranium(II) but no simple ions are known to exist in solution for that state. Ions of U3+liberate hydrogen from water and are therefore considered to be highly unstable. The UO2+ ion represents the uranium(V) state and is known to form compounds that include inorganic ions such as carbonate, chloride and sulfate, and various organic chelating agents. Phase relationships in the uranium-oxygen system are highly complex. The most important oxidation states of uranium are uranium(IV) and uranium(VI) and their two corresponding oxides are, respectively, uranium dioxide (UO2) and uranium trioxide (UO3). Other uranium oxides, such as uranium monoxide (UO), diuranium pentoxide (U2O5), and uranium peroxide (UO4•2H2O) are also known to exist. The most common forms of uranium oxide are triuranium octaoxide (U3O8) and the aforementioned UO2. Both oxide forms are solids that have low solubility in water and are relatively stable over a wide range of environmental conditions. Triuranium octaoxide is (depending on conditions) the most stable compound of uranium and is the form most commonly found in nature. Uranium dioxide is the form in which uranium is most commonly used as a nuclear reactor fuel. At ambient temperatures, UO2 will gradually convert to U3O8. Because of their stability, uranium oxides are generally considered the preferred chemical form for storage or disposal. Uranium metal heated to 250 to 300 °C reacts with hydrogen to form uranium hydride. Yet higher temperatures will reversibly remove the hydrogen. This property makes uranium hydrides convenient starting materials to create reactive uranium powder along with various uranium carbide, nitride, and halide compounds. Two crystal modifications of uranium hydride exist: an α form that is obtained at low temperatures and a β form that is created when the formation temperature is above 250 °C. All uranium fluorides are created using uranium tetrafluoride (UF4); UF4 itself is prepared by hydrofluorination or uranium dioxide. Reduction of UF4 with hydrogen at 1000 °C produces uranium trifluoride (UF3). 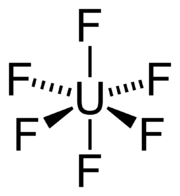 Under the right conditions of temperature and pressure, the reaction of solid UF4 with gaseous uranium hexafluoride (UF6) can form the intermediate fluorides of U2F9, U4F17, and UF5. The resulting UF6 white solid is highly reactive (by fluorination), easily sublimes (emitting a nearly perfect gas vapor), and is the most volatile compound of uranium known to exist. The major application of uranium in the military sector is in high-density penetrators. This ammunition consists of depleted uranium (DU) alloyed with 1–2% other elements. At high impact speed, the density, hardness, and flammability of the projectile enable destruction of heavily armored targets. Tank armor and the removable armor on combat vehicles are also hardened with depleted uranium (DU) plates. The use of DU became a contentious political-environmental issue after U.S., UK and other countries' use of DU munitions in wars in the Persian Gulf and the Balkans raised questions of uranium compounds left in the soil (see Gulf War Syndrome). Depleted uranium is also used as a shielding material in some containers used to store and transport radioactive materials. Other uses of DU include counterweights for aircraft control surfaces, as ballast for missile re-entry vehicles and as a shielding material. Due to its high density, this material is found in inertial guidance devices and in gyroscopic compasses. DU is preferred over similarly dense metals due to its ability to be easily machined and cast. During the later stages of World War II, the entire Cold War and to a much lesser extent afterwards, uranium was used as the fissile explosive material to produce nuclear weapons. Two major types of fission bombs were built: a relatively simple device that uses uranium-235 and a more complicated mechanism that uses uranium-238-derived plutonium-239. Later, a much more complicated and far more powerful fusion bomb that uses a plutonium-based device in a uranium casing to cause a mixture of tritium and deuterium to undergo nuclear fusion was built. The main use of uranium in the civilian sector is to fuel commercial nuclear power plants; by the time it is completely fissioned, one kilogram of uranium can theoretically produce about 20 trillion joules of energy (20 × 1012 joules); as much electricity as 1500 metric ton of coal. Generally this is in the form of enriched uranium, which has been processed to have higher-than-natural levels of uranium-235 and can be used for a variety of purposes relating to nuclear fission. Commercial nuclear power plants use fuel that is typically enriched to around 3% uranium-235, though some reactor designs (such as the CANDU reactors) can use unenriched uranium fuel. Fuel used for United States Navy submarine reactors is typically highly enriched in uranium-235 (the exact values are classified). In a breeder reactor, uranium-238 can also be converted into plutonium through the following reaction: 238U(n, gamma) -> 239U -(beta)-> 239Np -(beta)-> 239Pu. Prior to the discovery of radiation, uranium was primarily used in small amounts for yellow glass and pottery dyes (such as uranium glass and in Fiestaware). Uranium was also used in photographic chemicals (esp. uranium nitrate as a toner), in lamp filaments, to improve the appearance of dentures, and in the leather and wood industries for stains and dyes. Uranium salts are mordants of silk or wool. The discovery of radiation in uranium ushered-in additional scientific and practical uses of the element. The long half-life of the isotope uranium-238 (4.51 × 109 years) make it well-suited for use in estimating the age of the earliest igneous rocks and for other types of radiometric dating (including uranium-thorium dating and uranium-lead dating). Uranium metal is used for X-ray targets in the making of high-energy X-rays. A person can be exposed to uranium (or its radioactive daughters such as radon) by inhaling dust in air or by ingesting contaminated water and food. The amount of uranium in air is usually very small; however, people who work in factories that process phosphate fertilizers, live near government facilities that made or tested nuclear weapons, or live or work near a coal-fired power plant, facilities that mine or process uranium ore, or enrich uranium for reactor fuel, may have increased exposure to uranium. Houses or structures which are over uranium deposits (either natural or man-made slag deposits) may have an increased incidence of exposure to radon gas. Almost all uranium that is ingested is excreted during digestion, but up to 5 percent is absorbed by the body when the soluble uranyl ion is ingested while only 0.5 percent is absorbed when insoluble forms of uranium, such as its oxide, are ingested. However, soluble uranium compounds tend to quickly pass through the body whereas insoluble uranium compounds, especially when ingested via dust into the lungs, pose a more serious exposure hazard. After entering the bloodstream, the absorbed uranium tends to bioaccumulate and stay for many years in bone tissue because of uranium's affinity for phosphates. Uranium does not absorb through the skin, and alpha particles released by uranium cannot penetrate the skin. The greatest health risk from large intakes of uranium is toxic damage to the kidneys, because, in addition to being weakly radioactive, uranium is a toxic metal. Radiological effects are generally local because this is the nature of alpha radiation, the primary form from U-238 decay. No human cancer of any type has ever been seen as a result of exposure to natural or depleted uranium but exposure to some of its decay products, especially radon, strontium-90, and iodine-131 does pose a significant health threat. Although accidental inhalation exposure to a high concentration of uranium hexafluoride has resulted in human fatalities, those deaths were not associated with uranium itself. Finely-divided uranium metal presents a fire hazard because uranium is pyrophoric, so small grains will ignite spontaneously in air at room temperature. ↑ 7.0 7.1 7.2 7.3 7.4 7.5 "Uranium." The McGraw-Hill Science and Technology Encyclopedia, 5th ed. (The McGraw-Hill Companies, Inc.) . Retrieved October 30, 2008. Emsley, John. 2001. Nature's Building Blocks: An A–Z Guide to the Elements. Oxford: Oxford Univ. Press. ISBN 0198503407. Greenwood, N.N., and A. Earnshaw. 1998. Chemistry of the Elements, 2nd ed. Oxford, UK; Burlington, MA: Butterworth-Heinemann. ISBN 0750633654. Online version. Hampel, Clifford A. 1968. The Encyclopedia of the Chemical Elements. New York: Reinhold Book Corp. ISBN 0442155980. Morss, Lester R., Norman M. Edelstein, and Jean Fuger, eds. 2006. The Chemistry of the Actinide and Transactinide Elements, 3rd ed. 5 vols. Joseph J. Katz, adapter. Dordrecht: Springer. ISBN 1402035551. Stwertka, Albert. 1998. Guide to the Elements, Rev. ed. Oxford: Oxford University Press. ISBN 0195080831. Radiation Information: Uranium. U.S. Environmental Protection Agency. Nuclear. U.S. Energy Information Administration. Uranium. Alsos Digital Library for Nuclear Issues. Hazardous Substances Data Bank. Uranium, Radioactive. TOXNET, National Library of Medicine. This page was last modified on 12 January 2016, at 15:28.